The 10th Ka‘u Coffee Festival announces that it is offering a new Ka‘u Valley Farms Tour and the return of Ka‘u Coffee & Cattle Day—complete with a hayride. These activities join a full lineup of engaging experiences highlighting the sprawling Ka‘u District and its award-winning coffee Saturday, April 21 through Sunday, May 6, 2018. The Ka‘u Valley Farms Tour on Thursday, May 3, kicks off with a visit to a hydroponic vegetable nursery, plus plantings of coffee and tea. The fun continues up the pastured slopes above Na‘alehu along the Kahilipali ahuapua‘a to the summit of Pu‘u Ho‘omaha (Hill of Leisure) for panoramic views of the coastline and hidden Makino Valley. Enjoy stories chronicling the land’s tenure from the monarchy to today. Guests will also view the development of a water system involving irrigation tunnels and take a brief walk into unspoiled native forest. Cost of the 9 a.m. to 2 p.m. tour is $35 and includes valley transport and lunch featuring the farm’s hydroponic bounty. Phone (808) 987-4229 or (808) 731-5409 to make a reservation and get directions. Ka‘u Coffee & Cattle Day returns to the festival 10 a.m. to 3 p.m. Friday, May 4, offering food and festivities at Aikane Plantation Coffee Farm. Guests tour the coffee operations, where descendants of the area’s first coffee farmer, dating back to the 1890s, explain how coffee is integrated into cattle ranching and other agriculture. The day includes a hayride and ranch barbecue buffet, featuring locally produced ingredients. 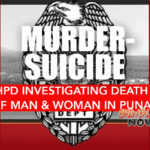 Cost is $25, reserve your spot and get directions by calling (808) 927-2252. The Ka‘u Coffee Festival kicks off Saturday, April 21 with the Miss Ka‘u Coffee Pageant and continues Friday, April 27 for the free Pa‘ina & Open House at Pahala Plantation House and free Ka‘u Recipe Contest on Sunday, April 29, at the Ka‘u Coffee Mill. Activities continue Wednesday, May 2 for the Ka‘u Mountain Water System Hike in Wood Valley and Ka‘u Stargazing at Mt. Makanau on Friday, May 4. 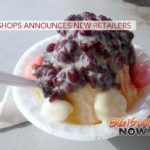 The festival culminates the weekend of May 5 and 6 at the Pahala Community Center for the free, action-packed ho‘olaule‘a on Saturday and Ka‘u Coffee College educational series on Sunday. The day-long ho‘olaule‘a, which last year attracted upwards of 4,000 attendees, sprawls inside and out and stages live music, hula, local food and crafts, keiki activities, educational displays, guided coffee tasting and farm/mill tours. This yearʻs Ka‘u Coffee College includes a technical representative from Shore Measuring Systems, a leading manufacturer of coffee testing equipment. Sponsorship opportunities are available. Vendor applications for Saturday, May 5, along with details on all festival activities, can be found at www.kaucoffeefestival.com. 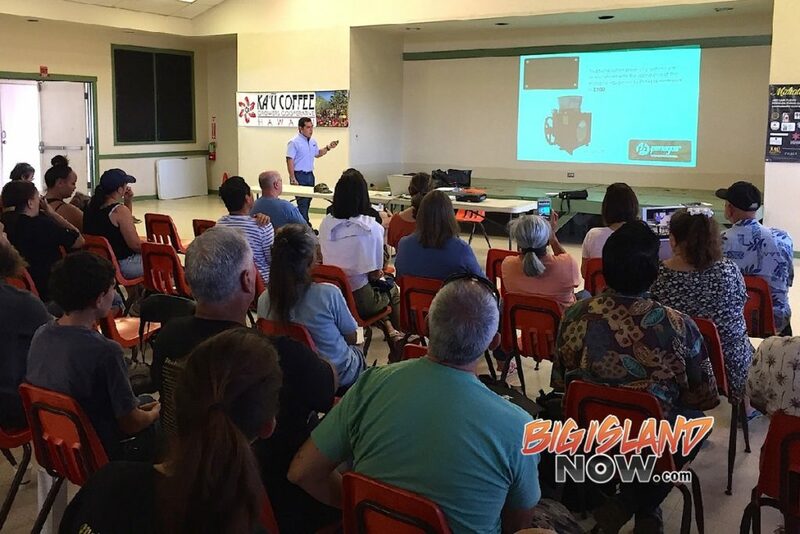 Ka‘u Coffee Festival vendor and sponsorship opportunities are available. 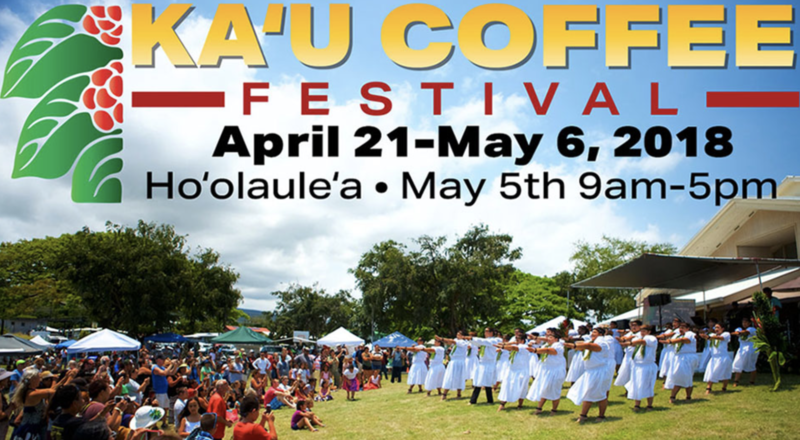 For more information and festival updates, visit www.kaucoffeefest.com, follow Ka‘u Coffee Festival on Facebook and @kaucoffeefest on Twitter and Instagram, or call (808) 929-9550.